We solve your foot problems. Chiropodology. Invest in your health, take care of your feet. 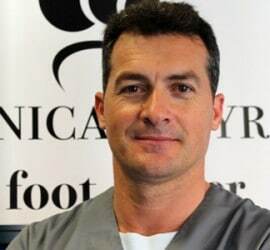 In our clinic we treat all kinds of alterations in the foot, from a simple alteration in the skin, to a morphological deformity. We conduct gait and posture analysis. We make all kinds of insoles depending on the pathology. Hallux valgus, or aslo popularly known as bunions, are no longer a problem for your feet. The improvement of the techniques and the accumulated experience guarantee us very satisfactory results. During the biomechanical assessment, CLINICA MAYRAL foot center performs an exploration of the dynamics of the human gait and a static postural study with baropodometry equipment. The orthopedic treatment we perform at CLINICA MAYRAL foot center is always a fully customized treatment. At CLINICA MAYRAL foot center, chiropody is the fundamental basis of foot care. CLINICA MAYRAL foot center works hand in hand with Federació Catalana de Ball Esportiu, Centre d'Esports Sabadell F.C, Tri&Du (running & cycling) CE Vila Olímpica, Cerdanyola FC and also with Adrián Esperón and Patricia Martinez, Spanish dancesport champion couple. We use S30 technology PODYLAS, the most advanced tool to attain healthy nails. Clinical Pilates, Specific adjustment technique (better known as SAT), conservative and invasive myofascial approach. Specialized attention in dancers: prevention and treatment of injuries, performance improvement in dance performance. Clínica Mayral – foot center director. “One of the factors that brings success to our Clinic is the mixture of the experience accumulated for so many years and the energy that we all contribute to our team, with the desire to improve ourselves day by day. "In only one hour my son Luis already underwent surgery and everything worked out perfectly. We went home very happy, and the attention and kindness, unbeateable"